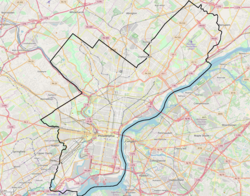 Francisville is a neighborhood in North Philadelphia, which is a section of the city of Philadelphia, Pennsylvania. Its boundaries are Fairmount Avenue to the south, Girard Avenue to the north, Broad Street to the east, and Corinthian Avenue to the west. In 2000, it had a population of about 4,500. It is sometimes considered to be a part of the Fairmount neighborhood, but Fairmount more specifically lies to Francisville's west. To its south is the Spring Garden neighborhood. Francisville's street grid is unique because some of it is parallel to Ridge Avenue, rather than being oriented North-South. This is because this section was settled before the uniform street grid of Philadelphia had extended that far north. The community was likely a small village on the Ridge Avenue route from Philadelphia proper (today's Center City) to East Falls. In recent years the community has become more activist, with the Francisville Neighborhood Development Corporation and Concerned Citizens of Francisville representing the neighborhood in efforts to improve housing and cut down on crime. A city program called the Neighborhood Transformation Initiative has brought the wrecking ball to many properties, with the hopes that building some new structures in the region is a better solution than costly renovations to blighted historic buildings. The famous rapper Lil Uzi Vert also originates from this area. The neighborhood is served by Broad Street Subway stations at Fairmount and Girard, the SEPTA Route 15 trolley on Girard Avenue, in addition to the 2, 33, and 61 bus routes. The Francisville Playground is located at 1737-39 Francis Street and has a full baseball field, children's play area, two basketball courts and a large community pool. This page was last edited on 11 February 2019, at 13:07 (UTC).